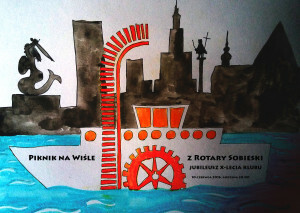 We would like to invite you for the Charity Picnic on the river with Rotary Club Warszawa Sobieski. Event will be held on June 10th, 20:00h. During event we will celebrate the 10th anniversary of our club as well as the handover of service so we will officially finish Rotarian year 2015/2016 and open new year 2016/2017. Price includes: food, wine and cruise on the Vistula river. During our Picninc we will collect money for our charity activities. We will held art auction. On the June 10th, 2016 we would like to also invite you for closing of exhibition in the metropolitan cities of Europe: Cracow – Berlin – Paris – Warsaw, that title is: “Sztuka Łączy – Kunst Verbindet” (“Art connects”). Honorary Patronage – Włodzimierz Chruścik – Dean of the Regional Chamber of Legal Advisers in Warsaw, Barbara Pawlisz – Governor of Rotary International D-2230 Belarus-Poland-Ukraine and Krzysztof Kopyciński – Governor Elect Rotary International D-2231 Poland. During the closing of exhibition on the June 10th, 2016 at 18:00 h the ceremony will be held to give “POLONUS ORDER” and “GERMANUS ORDER”.